How Women Rugby Started In Fiji? The Saint John Marist womens 7s team in the late 1980s. With women’s rugby soaring to new heights on the World Rugby scene, many women of yester years will recall how they were thrown into an all new ball game. Where they played in front of a wild and unkind rugby crowd comprised mainly of people learned in the old days where women stayed home and men got their jerseys dirty. Laijipa Naulivou remembers those days vividly when she was asked by old friends who were connected through hockey, rugby or the often rowdy aftermatch days at one of Suva’s two rugby clubs- the then Saint John’s Marist Club. 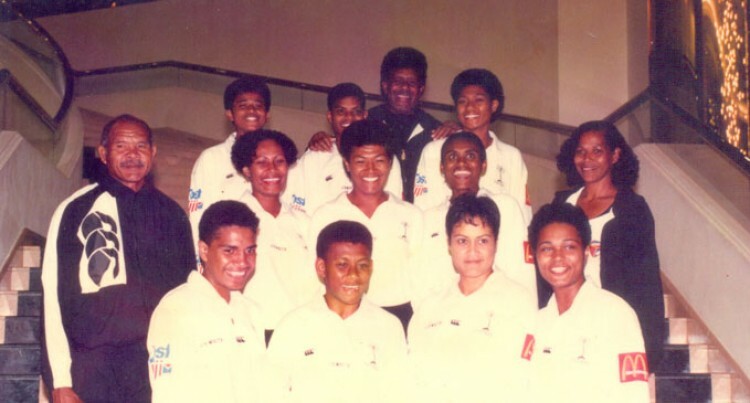 Naulivou, then a formidable national hockey player and White Fire netball player, was approached by Paulo Nawalu’s wife, Tupou in 1989 to be part of the St John’s Marist Women’s 7s team. Having a sporting pedigree and being a keen sportswoman she was a natural choice. The first official women’s tournament attracted 16 teams including the St John’s Marist Rugby Club led by Tupou and the towering Lakeba native. Laijipa said the stigma they had to face in those early days, particularly amongst a crowd not used to seeing women playing a men’s sport. But forgive the puns the game went on, Laijipa and the motley crew of other pioneer women ruggers got their jerseys dirty, and the rest was history. White Fire led by Tuxson beat St John’s Marist to win that first tournament and thus women’s rugby stamped itself as a permanent item at the St John’s Marist 7s. “I salute those club members who were behind this move and are no longer with us people like George Reade, Ratu George Cokanauto Mara, Manueli Nawalu, George Sailosi, Vili Rasigatale, John Moses, Aisake ‘Marsh’ Nadolo, who played for QVS but was always at the club helping us out,” Laijipa said. “The first ever Fiji women’s team that left our shores was in 1997 and they played in the Hong Kong 7s. After Hong Kong, those snide comments became less as they had earned the respect of rugby spectators. Today, Elenoa Kunatuba and her mother Tapenisa run the Marist Seahawks women’s team and they will be taking part at the upcoming Marist Sevens event from March 6-7. The women’s tournament will host 16 teams this year with slots being taken up quickly by potential teams around the nation. Marist Rugby Club president Lawrence Tikaram said women’s rugby has become a permanent item on the rugby scene and it was all thanks to people like Tupou Nawalu, Laijipa Naulivou, Vicki Tuxson and the officials like the late George Reade and Pio Bosco Tikoisuva. He said without them women rugby would not have soared to the popularity it has reached today. “At the same time the Marist Volleyball Club and Mobees Hockey side have continue to be members of our multi-talented club,” he said. “Today women’s rugby can thank officials and members of the Flagstaff based-rugby club for the early days where women dared to trade their canvasses and bibs for the rugby jerseys and studded boots. We invite women clubs and fans to come out in support for the event this year,” Tikaram added.